Friday 13 April 2012: Fundraising Party! Prepare to party at the People’s Republic of Stokes Croft! On Friday 13 April at 7.30 pm, the No Tesco in Stokes Croft campaigners are holding a fundraising night at 35 Jamaica Street, BS2 8JP – with DJs, live music, poetry, street theatre, and The Occasional Cinema in the adjoining Yard. 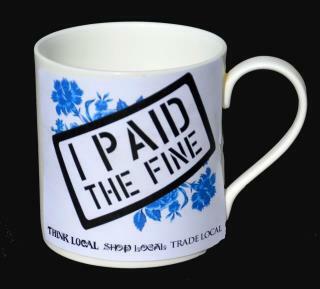 Buy a limited edition “I paid the fine” mug – £12 each – and you could win 12 of the last post-riot ‘Tesco Petrol Bomb’ posters donated by Banksy (pictured). Randomly selected, 12 of the mugs will come with the graffiti artist’s original April 2011 “commemorative souvenir poster“. Mugs with Banksy posters are available ONLY on the night of Friday 13 April 2012. We are partying a year after Tesco opened in Stokes Croft on 16 April 2011. We tried to stop Tesco with every legal means – and we lost. We may have lost the legal battle but the war is by no means over. As the Bristol People’s Supermarket starts to trade, the Boycott Tesco campaign continues and the Carriageworks and Westmoreland House Action Group gains momentum, local resilience continues to thrive. Check this latest piece on Stokes Croft from the Guardian on Bristol’s most bohemian neighbourhood. Help pay off our £2,000 judicial review court costs – and be part of social history.